Is this outdoor jacket maritime or alpine? You can decide that yourself because at first glance it can be assigned to both clothing styles. Navy coloured diamond quilt on front including hood. Wonderfully warm and soft material, enhanced by leather piping on the breast panels, the closure edges of the jacket and on the hood. 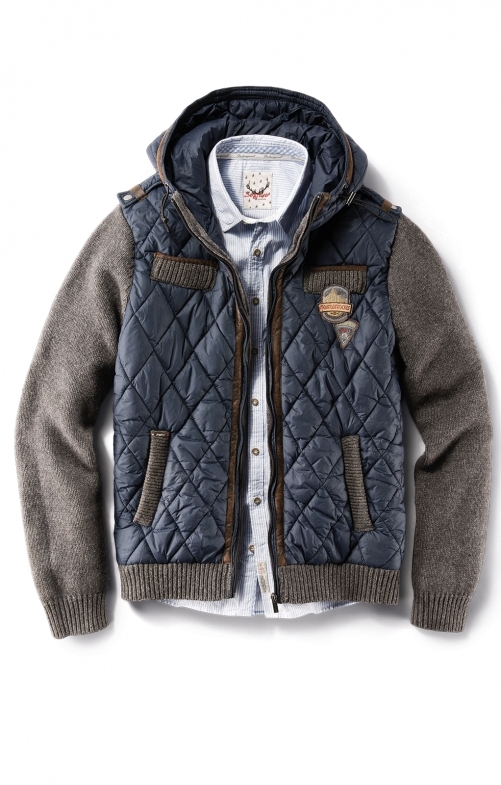 This sporty outdoor jacket with medium grey knit on the sleeve and on the waistband is offset. Uncomplicated, casual and super enjoyable for the transition or cool evenings. Due to the neutral colours, this practical outdoor jacket can be perfectly combined and will give you a lot of pleasure.